When your child in the 12-18 month age range is waking early from naps, you are left wondering not just “how to do I fix this?” but “should I fix it or drop a nap?” This post takes you through what to do when your pre-toddler is waking early from the morning nap. 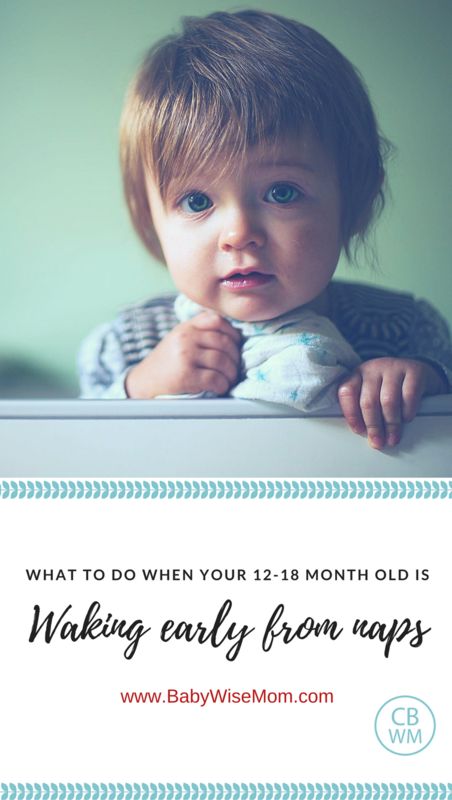 First, if your child is waking early from his morning nap and is under 14 months old, be sure to see Dropping the Morning Nap (from 2-1 naps) Transition Time: https://www.babywisemom.com/2008/10/dropping-morning-nap-from-2-to-1-naps.html. On Becoming Pre-Toddlerwise has some additional ideas for dealing with early waking from naps found on page 80. Here are their suggestions along with my method of diagnosis. Of course, your first job is to find out why your child is waking early. First, think through your days since your baby started waking early. Is there anything that has changed at all? If so, try to get things back to where they were before things changed. For example, as Pre-Toddlerwise asks, has their been a change in the environment? What kinds of noises are going on outside? What is the temperature in your home? What noises are going on inside? Another example from Pre-Toddlerwise is has their been a change in your routine? Have you been going out in the mornings, or started staying in in the mornings? Has your child started going down at a different time? Is he waking in the morning earlier or later than he used to? Another example from Pre-Toddlerwise is to evaluate food intake. Some children this age start to not eat as much at breakfast because they are anxious to go play. This is a tricky one to evaluate because after age one, most children dramatically decrease the amount of food they eat, so less food might not necessarily be your culprit, but it is definitely something to consider. You child might be in need of more solids. I would add–is your child sick at all? Teething? If you feel like nothing has changed, then it is time to evaluate what might need to change. If nothing has changed, you most likely need to experiment with morning waketime length before nap. You can make the time longer before nap, you can shorten your nap, or you can do both. For more on this, see the post I linked at the beginning of this post. Pre-Toddlerwise points out the need to evaluate the 24 hour sleep period. If your child is getting too much night sleep, he won’t need as long of naps in the day. Find the right balance between night sleep (10-12 hours) and day sleep (3-4 hours). There can be some variance–some of my children have needed more sleep than others. So be sure to go with what you feel is correct for your individual child. This can be a hard transition period. Baby isn’t quite ready to go to one nap, but also two naps seem to be too much. If working with waketime and naptime length doesn’t help things, just don’t let it stress you. I find even if baby is laying in bed for a while awake, it is more restful than if baby is up interacting with the family. So long as baby is happy, a rest time in bed is better than nothing. And the good news is you are moving closer to one nap time, which is the very best! Help! We are having such a hard transitioning to 1 nap. My son, Charlie, has been a great napper. Now, he is 18 months. He stopped falling asleep in the morning, or if he did fall asleep in the morning, he wouldn't sleep in the afternoon. So, I slowly started moving toward 1 nap in the afternoon. But, he just won't sleep longer than 45 minutes or an hour. This has been happening for 6 weeks now. I feel like we have tried everything from changing the nap time to quiet time in the morning. I am not sure why he won't sleep any longer than 1 hour. Do you have any suggestions? Our son is 17 months old and for the last week he has been waking up between 3 and 4am. He has been a great sleeper since around 8 weeks old. We've tried CIO and rocking back to sleep. CIO has been awful and he will scream so hard until he makes himself sick. Because of this, his naps during the day have been around 2-3 hours each (twice a day!). Do I just keep sticking with CIO and limiting naps? He isn't sick and I don't think he has any new teeth coming in. I'm exhausted! Excellent comment Kristin. It is so true. Kander,Have you tried changing what time he goes down for his one nap? Laura, any time a child who has been a historically been a great sleeper suddenly starts waking and upset, I assume it is due to pain or discomfort. I first look at sickenss or teething. It seems that is usually the case. It can also be too hot or too cold when weather changes.